Crackdown man David Jones has revealed Crackdown for Xbox One, marking a return for Crackdown, but this time on Xbox One. It looks a lot like Crackdown, with the classic cel-shaded Crackdown look, but shinier, more stylised and prettier. We took a screengrab from the debut Crackdown trailer showing one of the Agents doing their superpowered high jumping thing. We've got to admit, it is nice to see Crackdown back on Xbox once again. It's not Crackdown 3. It's just called Crackdown. 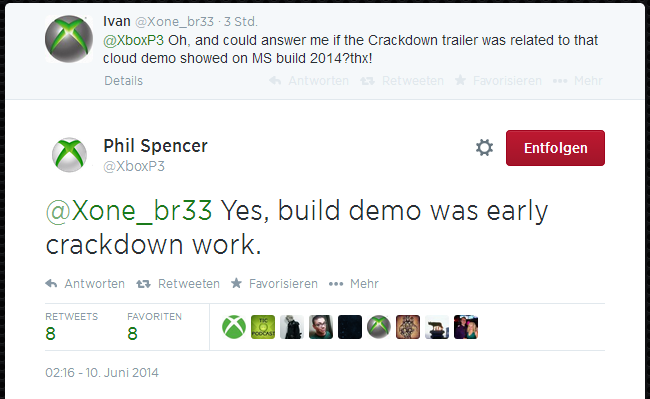 Crackdown will presumably be coming to Xbox One sometime in 2015. We'll have more on the game as soon as it emerges. hope its a reboot of Crackdown. fantastic they have Mr GTA on the case. Phil said in the after show that Crackdown will be using the cloud for the destruction and other augmentation. It will be very interesting to see how this develops. I know it was just a short pre rendered trailer but this game was my favorite announcement so far for E3. The 1st Crackdown is still the most fun I've had in an open world game. Actually a good chance it could look that good. This is going to be awesome. I didn't play #2 just because it got lost in the shuffle and then heard it wasn't fully worth going back to, but #1 is in my top 5 for favorite 360 games probably. Anybody knew that after the Cloud Demo months ago, that Crackdown 3 probably would be using that for a fully destructible city. We only need wait and see how well it well perform or if it will be a dud. GameStop has this listed for release Dec 14, 2014......is that even possible? i know David Jones is back but his Realtime Worlds was shut down few years back right? I can't wait for this, the first one was incredibly fun to play. I remember standing on top of a building looking across the city when suddenly, explosions began blocks away. Next thing I know, I'm watching this chaotic battle fly past me. My brother had logged on and started some mayhem...just a cool, cool gaming moment. And climbing the agent tower and jumping down for the achievement, that was just amazing! David Jones has a new company called Cloudgine, they are making Crackdown. Also if they manage to pull that level of destruction off in the actual game, it will pretty much be GOTY for me! I just can't way to scale buildings in a single bound again! oh, i see. didn't know he got new studio going. X1, Cloud, David Jones. it's gonna be GOTY for sure! Is this really coming this year? According to the ntkrnl rumor, 2016. Agreed... if that tech demo comes to life in Crackdown.. sold. Im going to contain my excitement till I see it in action. But if I can pick up a car and throw it into a building.......man.....that is a game changer. Well that's a long time to wait. That it is. But look at it this way the last Crackdown had a pretty short dev time(8 months) and felt like a glorified expansion pack rather than a proper sequel. I don't mind them giving this a while to cook, especially if they are attempting to deliver on the sheer amount of destruction shown in that preview. It would be well worth the wait! After this E3, I'm more convinced than ever that he was a controlled leak. Can't wait for more Crackdown. I really enjoyed Crackdown 2, in isolation it was a good game. The trouble is people compare it to Crackdown 1 hence feels like a glorified expansion pack. I can't wait for Crackdown 3. Crackdown 2 was sweet. I'd be lying if I didn't say that I'd mind some areas with the Freaks in it. Maybe like an underground lair or something. Hey, remember that spongebob episode where Squidward goes to the future and he starts crunching and stuff while muttering "fuuuuutuuuuuuurre?" That's me right now. Cool. Looks like the destruction video months ago is for a purpose after all.... Crackdown 3. Actually Crackdown is the most impressive tech demo I've ever seen. And this is only the first step. I'm sure all the big graphic engines will soon support cloud computing for PC and Xbox One. E3 2015 will be DX12 + cloud computing.